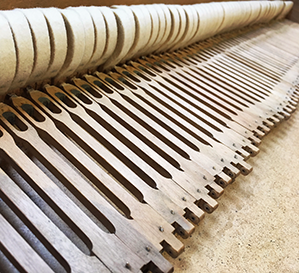 In order to maintain your piano in its best condition, it is essential to carry out maintenance, especially piano tuning, on a regular basis. Once the above have been inspected, any issues willl be relayed to you to see if you would like them corrected. The tuner will give an indication of any costs - often if there are just a few minor adjustments no charge will be made. Minor Repairs Minor repairs could include sticking keys, broken hammers, or broken strings. It could be a vibration coming from the lock, or the hinge of a piano. It could even be the glass protecting the picture hanging above the piano that could be causing the vibration. Minor Faults In some cases a very minor fault may not be noticed by the tuner, so it is imperative that you point out all of your concerns before the tuner starts work. Many piano tuners are not piano technicians, and many piano technicians are not pianos tuners. Remedial Work All our tuners are also technicians and they undergo continuous personal development through courses and workshops to further, and hone their skills. 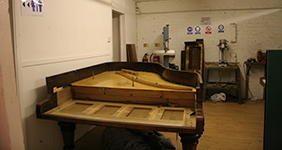 If you have a piano that requires remedial work, please make sure that you ask for one of our tuner/technicians. Is the mechanical part of the piano which transfers the motion of the fingers on the keys to the hammers which strike the strings. The action comprises of over 9,000 moving parts which require adjustment to critical tolerances for this movement to be accurately transfered to the hammers. The dampers stop the strings from vibrating after the hammer has struck the strings (unless the loud pedal is depressed). They are controlled mechanically by the damping system. This supports the mecahnical parts which are played by the pianists fingers - The Keys. 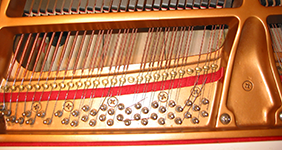 These keys act on a fulcrum and through a series of connections the movement is relayed to the piano action and subsequently to the movement of the hammer striking the string. Depending on your piano, there is likely to be either two or three pedals. The right pedal has a unifomed effect on both uprigh and grand pianos in as much as it is the 'loud' pedal and liftes the dampers uniformally so that the strings continue to vibrate after the key ahs been released. The left pedal (often called the Una Chorda) on grand pianos shifts the action to the right so the hammers only strike a smaller number of strings thereby giving the effect of playing quiter. 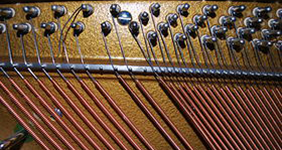 On an upright piano the left pedal moves the hammers nearer the strings so the actual impact is reduced. The middle pedal on an upright piano often engages a muting system, while on a grand piano the middle pedal (often referred to as the sostenuto) raises the damper on an individual note, allowing that note to continue to vibrate.